Along with the rest of country, the National Sports Day was also on Wednesday celebrated across Arunachal Pradesh in a befitting manner. National Sports Day or NDD in India marks the birthday of Dhyan Chand Singh, the hockey player, who won gold medals in Olympics for India in the years 1928, 1934 and 1936. State’s Sports and Youth Affairs Minister, Dr Mohesh Chai, who graced the celebrations initiated by the Directorate of Sports here at the banquet hall here, lauded the sportspersons who have excelled in various tournaments and made the State and country proud. 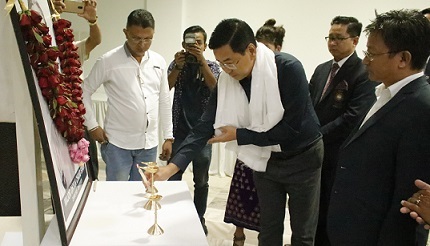 Dr Chai also asked people to give priority to sports and fitness-related activities, saying it will contribute towards a healthier Arunachal and India. Taking opportunity, the minister also said that Arunachal has approximately 36 state sports associations, out of which many are defunct and non-functional. Chai opined that both the government and sports authority should stop funding such associations. He further thanked Chief Minister Pema Khandu and Deputy Chief Minister Chowna Mein for sanctioning a new sports academy at Miao from. In his welcome address, Sports and Youth Affairs secretary, Dani Salu told the huge gathering that the state government was according top priority to sports and added that a sports policy was in the offing that would address the problems being faced by the sports persons in state. Salu further encouraged the youth to take up sports seriously so as to make a career out of it. Meanwhile, the NDD celebration at the banquet hall was divided into two sessions. Where the first session saw a seminar being conducted that covered subjects of ‘why youth play and quit sports’, ‘parental responsibilities to young athletes’ and ‘elite sports performance factors’, presented by members of GRIT, Mumbai, GoSports foundation, Bangalore and Sportseed, New Delhi, the second session saw cash incentives and awards being given out to 89 meritorious sports persons. Earlier, Dr Chai launched the official website of Directorate of Sports, with the domain www.directorsportsarunachal.com and software for player tracking management system. The player tracking management system would be useful for Sports Associations to intimate the department before participating in any national or international tournaments and they can also upload the achievements of the players. A unique players’ ID would be generated in this process. Among others Sports director, Tadar Appa, deputy director Mala Lingi, chairman and treasurer of Arunachal Olympic Association and representatives of various sports associations and students and coaches of Sangay Lhaden Sports Academy participated in the daylong celebrations. The Day was also observed at Tawang, Aalo, Roing, Khonsa and at Koloriang with various programmes.